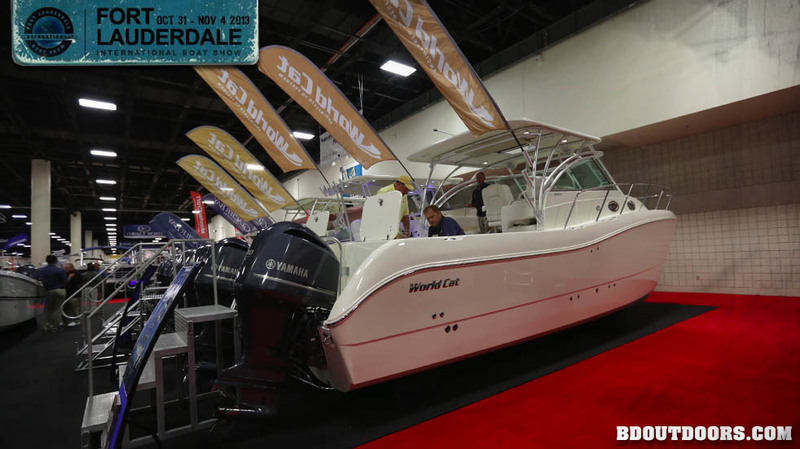 The Fort Lauderdale International Boat Show is one of the largest on the water boat shows. They bring in tons of floating docks and literally build the show around the boats as they arrive. 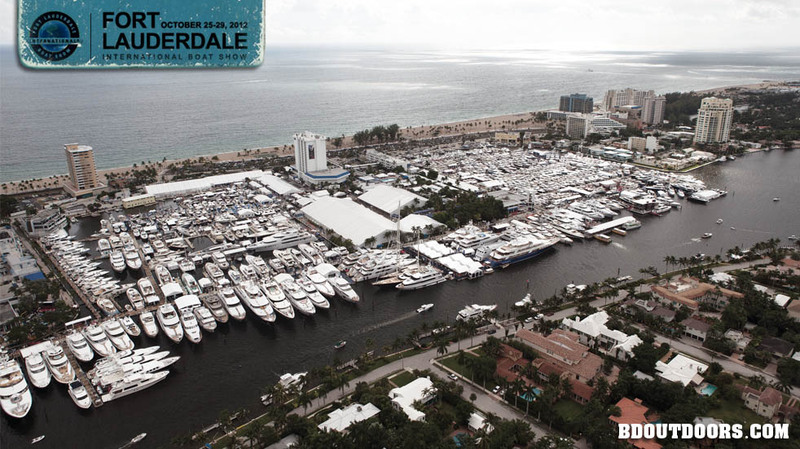 The show has something for everyone, weather you want to look at a paddle board or a 200 foot yacht with a helicopter. 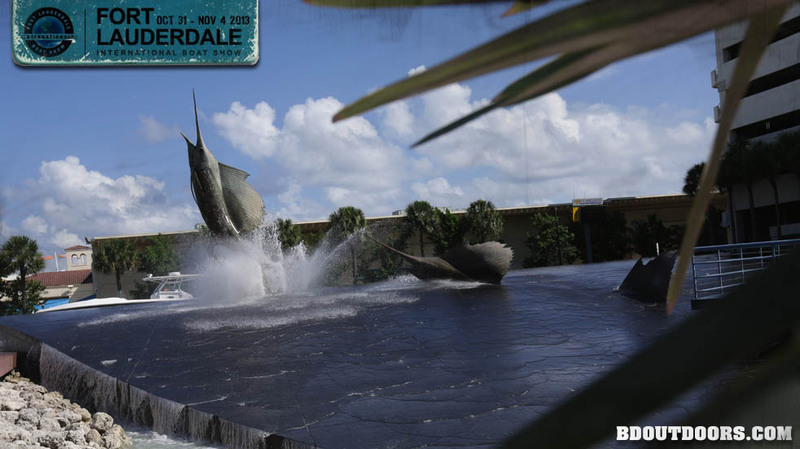 As you arrive at the Fort Lauderdale Convention Center, this amazing sculpture by Kent Ulberg will put you in the mood for fishing! 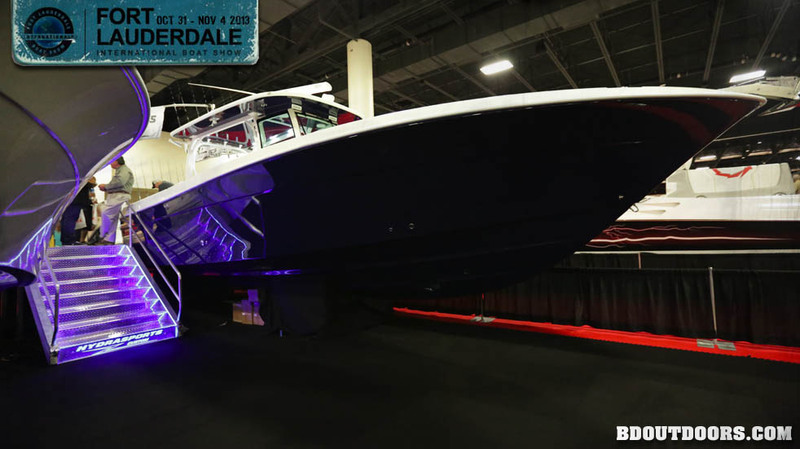 Many boat builders bring their latest designs to the boat show. 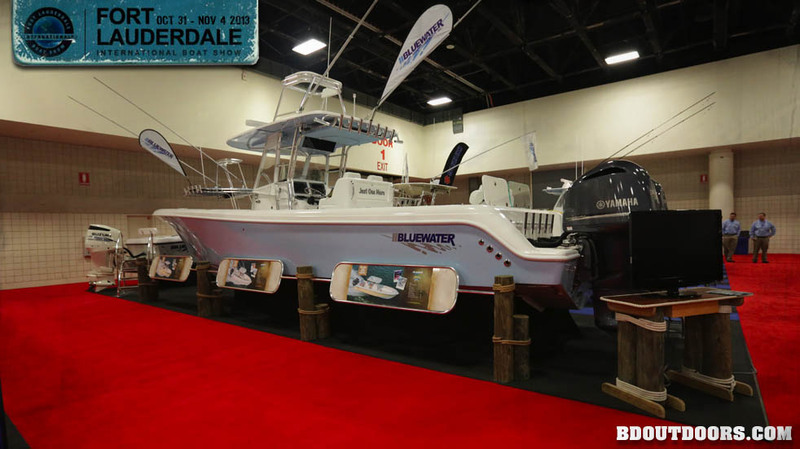 Bluewater has been building high-end fishing boats for years. 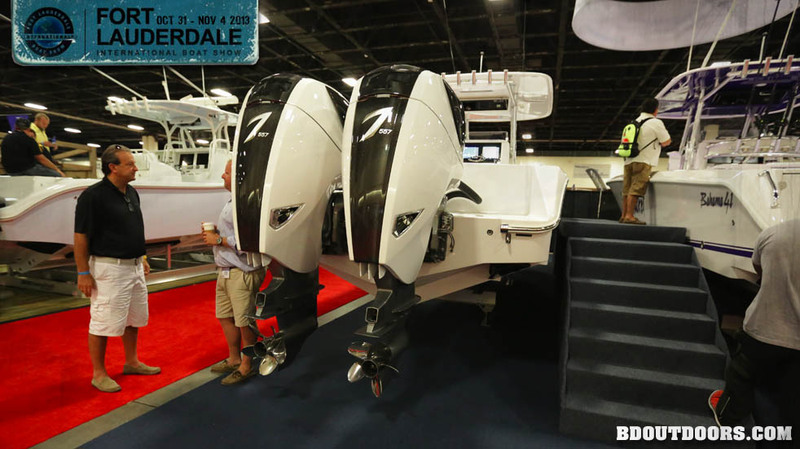 In a special press event, SeaVee unveiled their new Z lineup of high performance stepped hulls fishing boats as well as their slick new 43 fish around model. 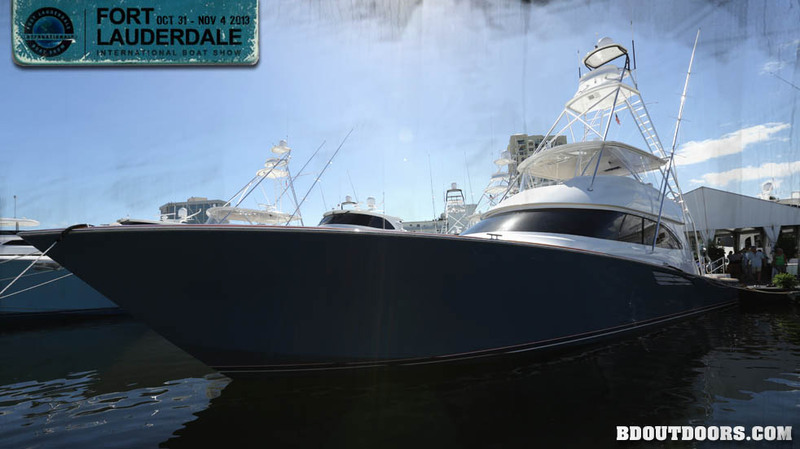 SeaVee had it’s new 43 Fish Around model on display. It was quite impressive in its quality and thoughtful designs. 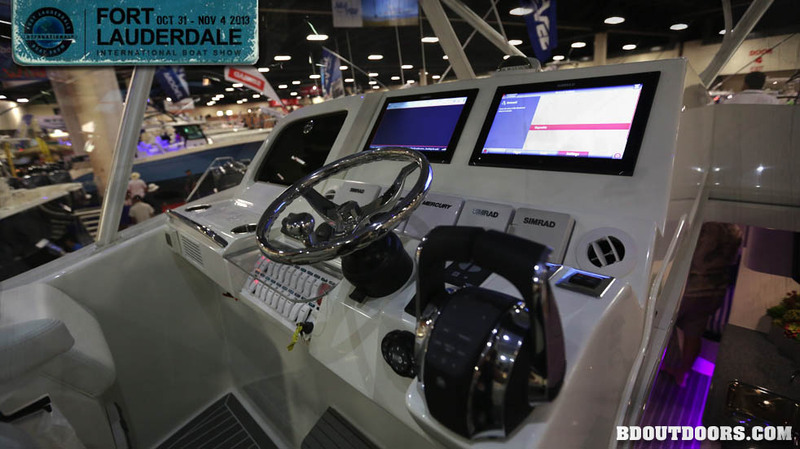 A state of the art command center is the best description of the helm of the 43′ SeaVee. 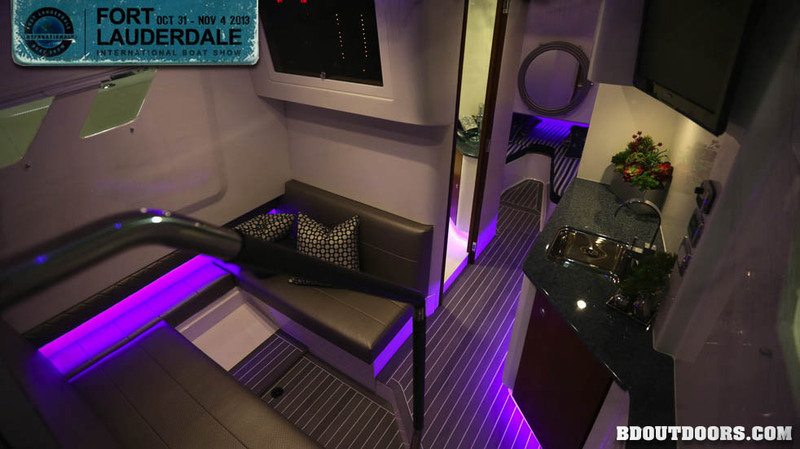 Fish and travel in style in the 43’s luxurious cabin with a very functional layout. 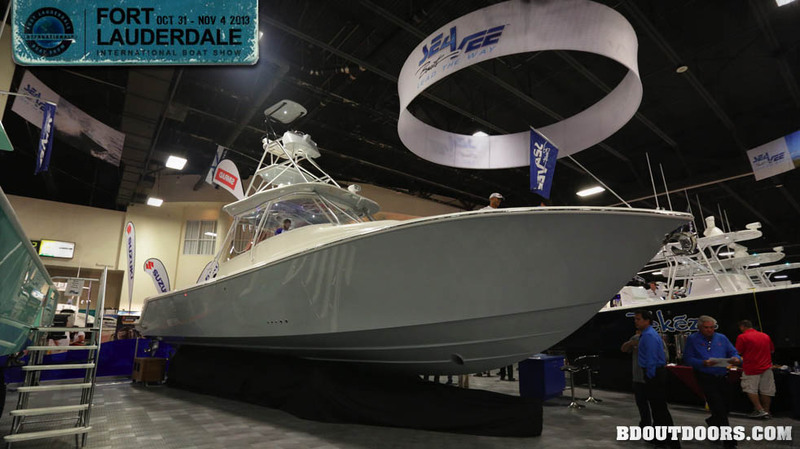 One of the most talked about highlights of the boat show was SeaVee’s unveiling of their new high performance stepped hull they call the Z series. 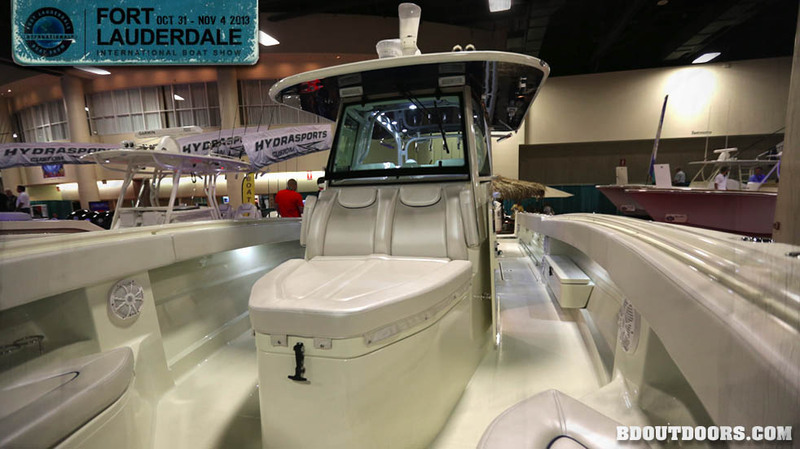 HydraSports boats made a huge showing in the show with their latest. Not your daddy’s HydraSport for sure. Tricked out is an understatement for these state of the art center consoles. 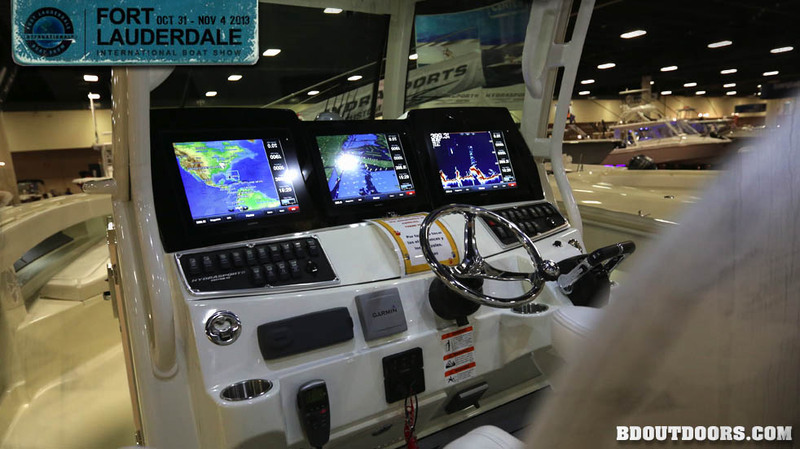 This HydraSport was rigged with some of the latest marine electronics. Clean design and fully functioning are exemplified here. 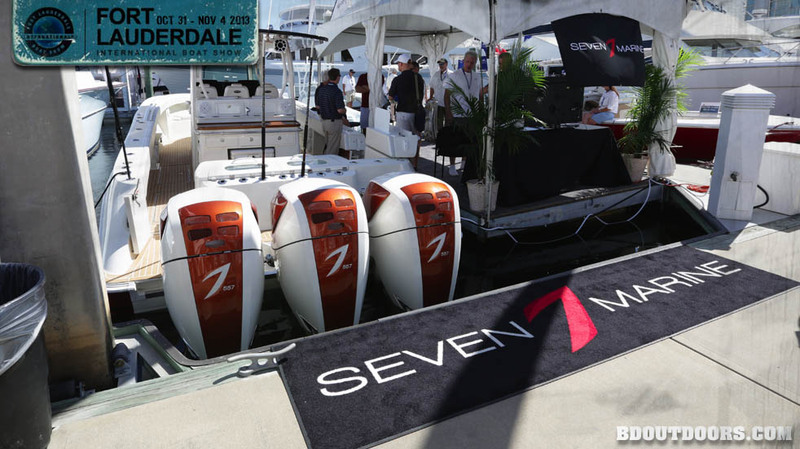 Seven Marine, makers of the new 557 horsepower outboard engines, sure look good on the back of this Bahama Boatworks. 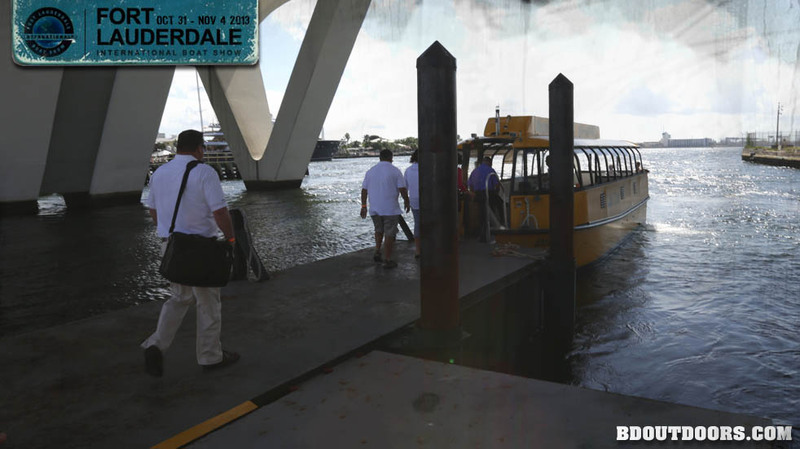 For a pretty reasonable price, passengers could ride all day as much as they wanted, between the boat show locations and popular pick up spots. 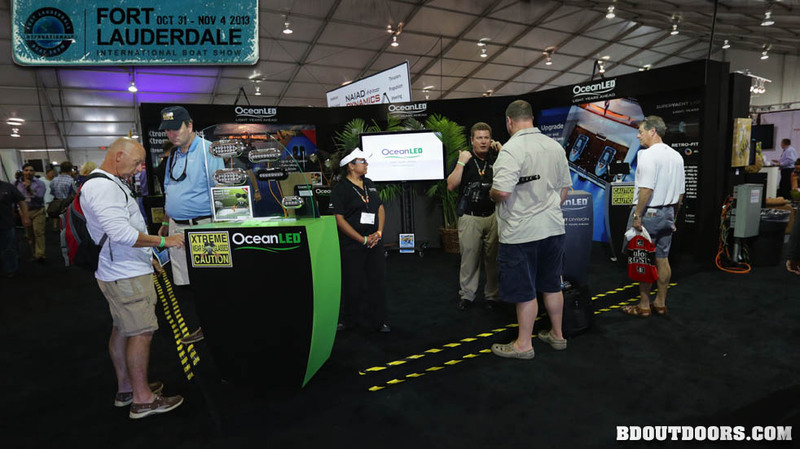 The boat show in Ft. Lauderdale is experienced at moving people. The show takes place is several locations, so getting people back and forth takes many forms. 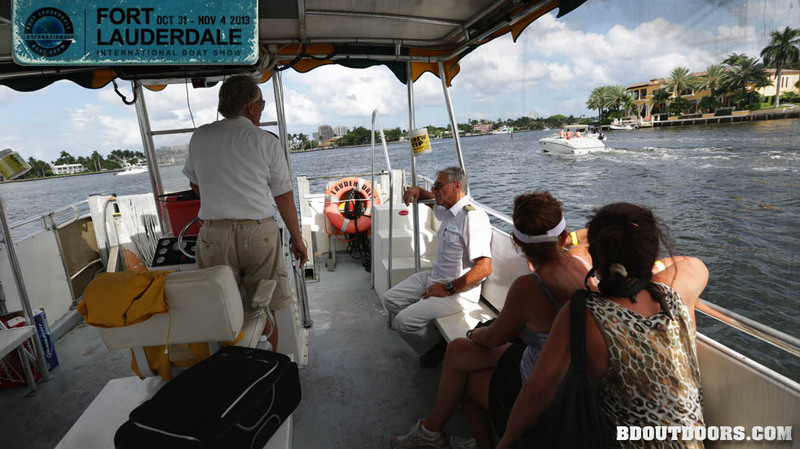 Water taxi is a more relaxing option to get around south Florida’s waterways. 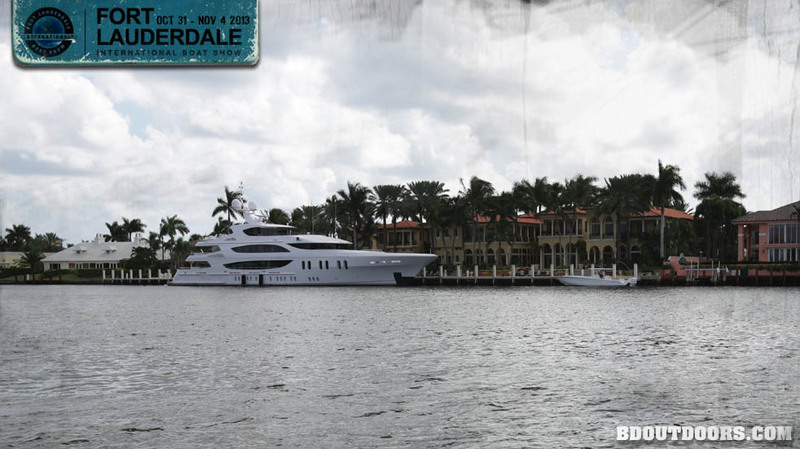 Mansions and their matching yachts line the waterway. The collection of wealth in this area is mind boggling. World Cat boats were here for those who are curious to check out their catamaran-styled hull. 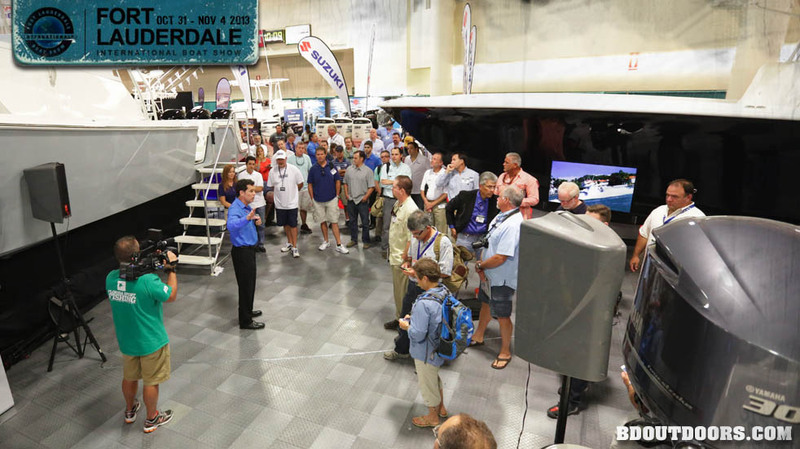 The boat show offers boaters the opportunity to touch and feel the latest marine electronics and talk to industry experts who can guide them on future purchases for their boats. 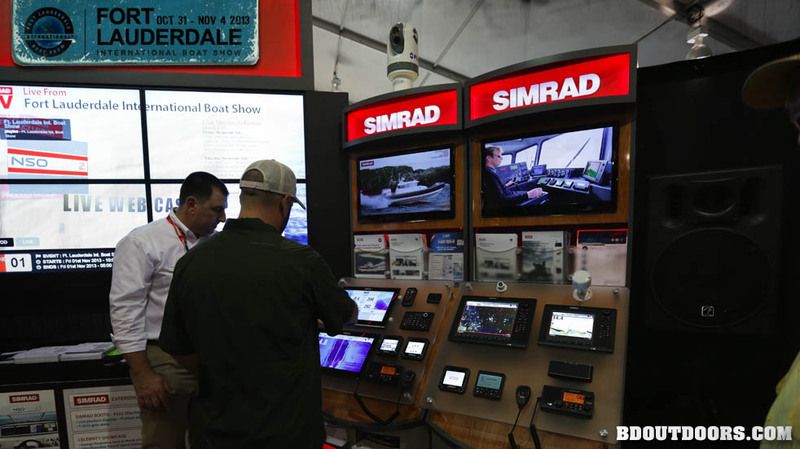 Simrad has long been a big name in marine electronics. 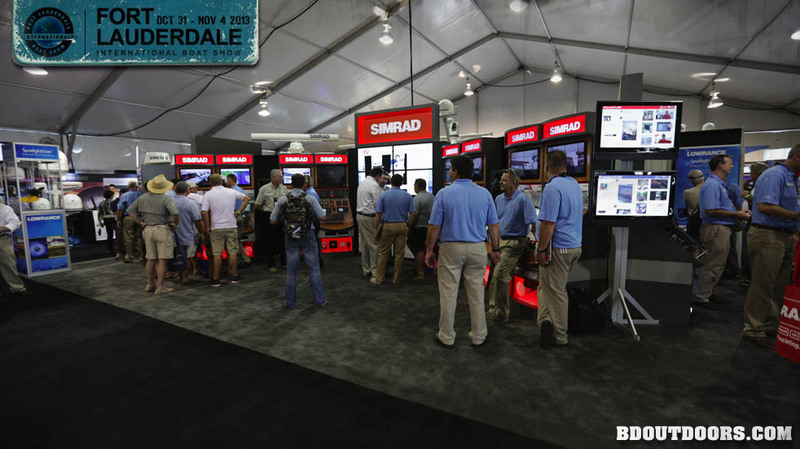 They had a great booth to display their latest user friendly, high-tech units. 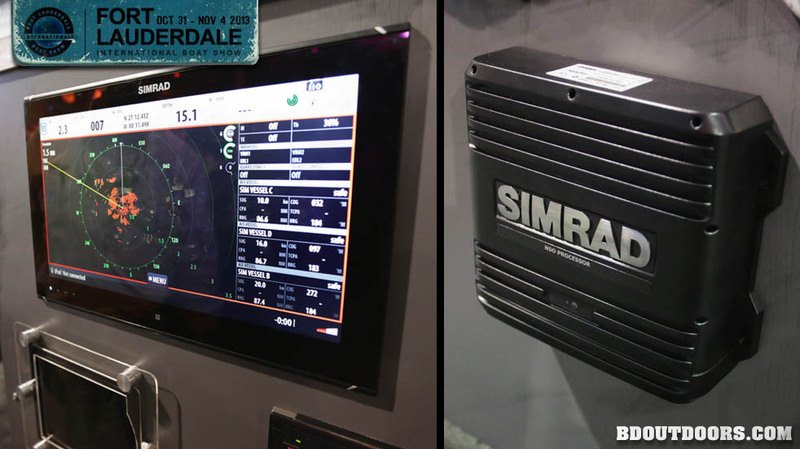 Simrad’s Evo 2 widescreen is one of the latest multi touch screen, interactive navigation systems. 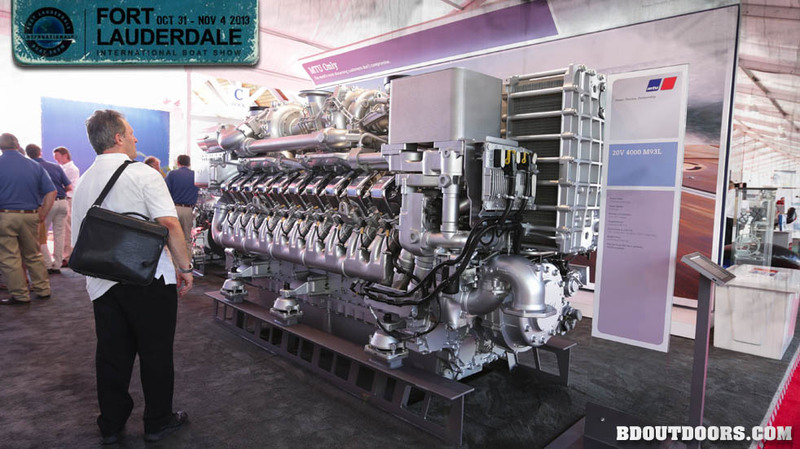 One could only stand in awe of MTU’s 20 cylinder diesel engine. It seems bigger than life, but then so do many of the yachts. 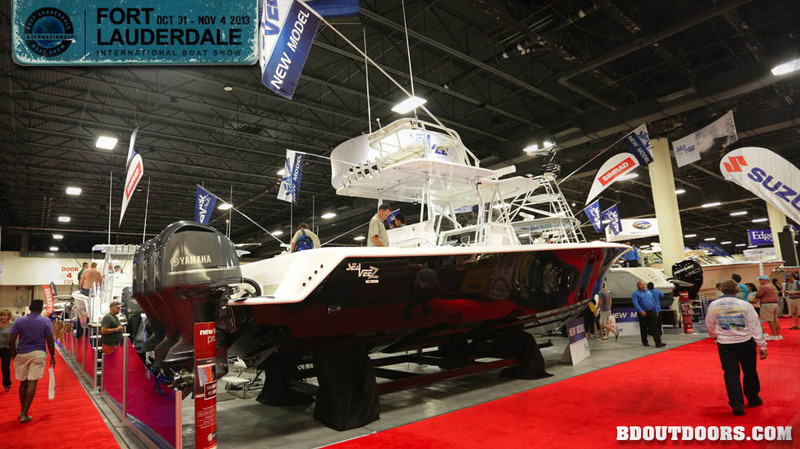 Custom painted Seven Marine outboards matched this custom rigged HydraSport on display. Seven Marine brought the Cadillac CTS-V’s lightweight, all-aluminum, fuel-injected, supercharged LSA V8 to the marine market. Here is a peek under the “hood” so to speak. 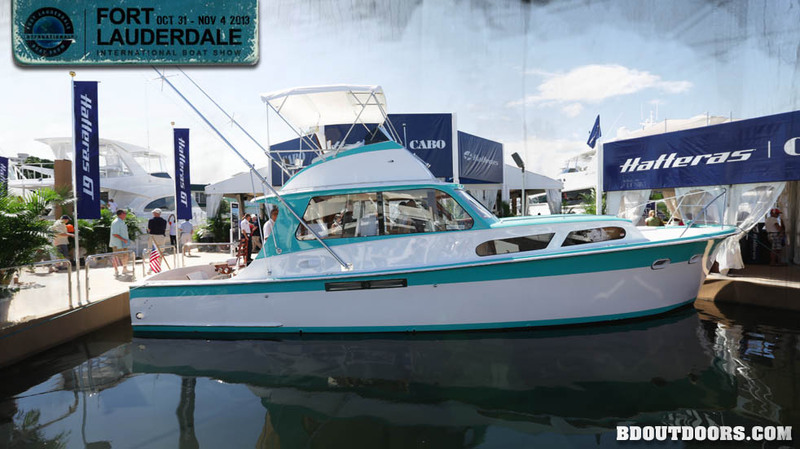 Hatteras yachts had many of their latest models at the show, but a real eye catcher was this fully restored 1960 model. The ever impressive Viking 80 was here in all her glory. 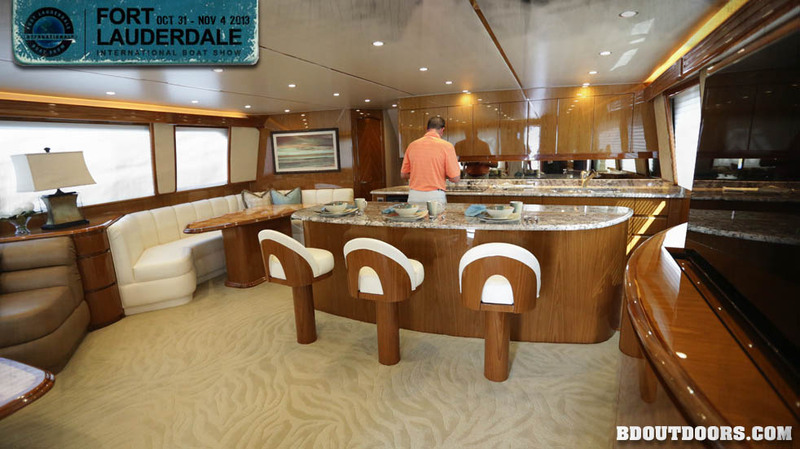 The salon and galley area of the Viking 80 is as nice as any custom boat around. 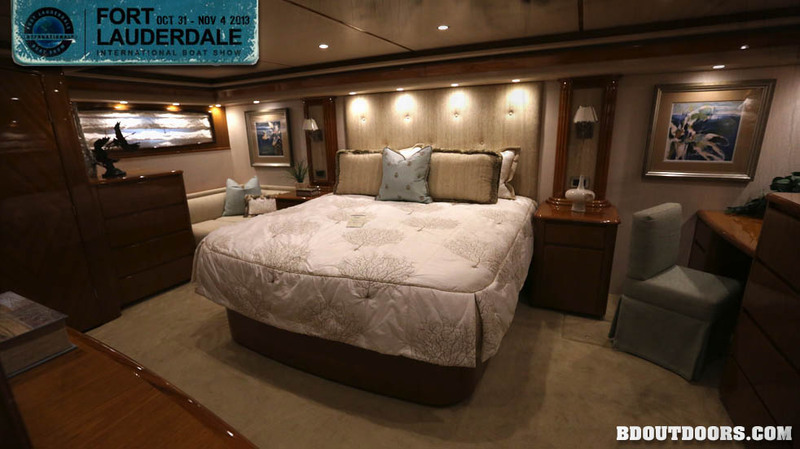 The master stateroom in the Viking 80 was bigger than my room in my house and way nicer, but I’m sure a price tag to match. 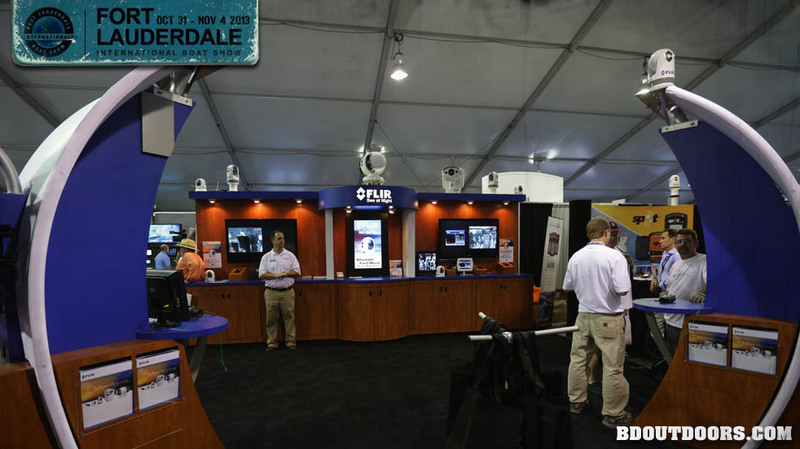 The FLIR booth was demonstrating the best in infrared cameras used by boaters to see objects in the dark by picking up the heat they emit. 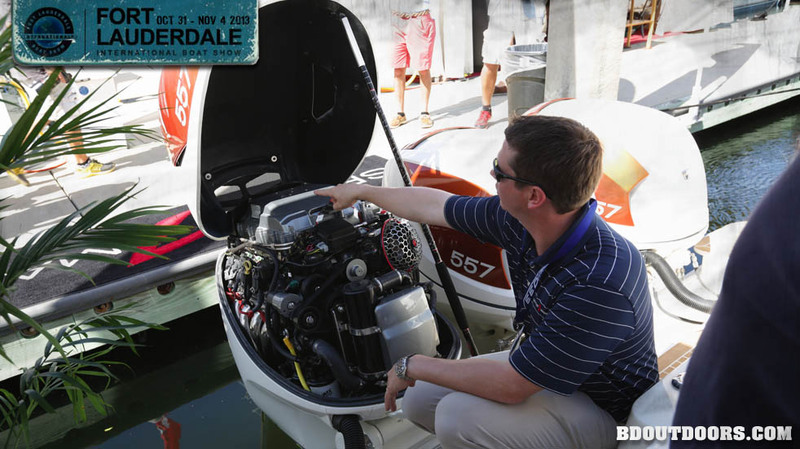 Infrared camera technology is an amazing tool and getting more affordable for average boaters. 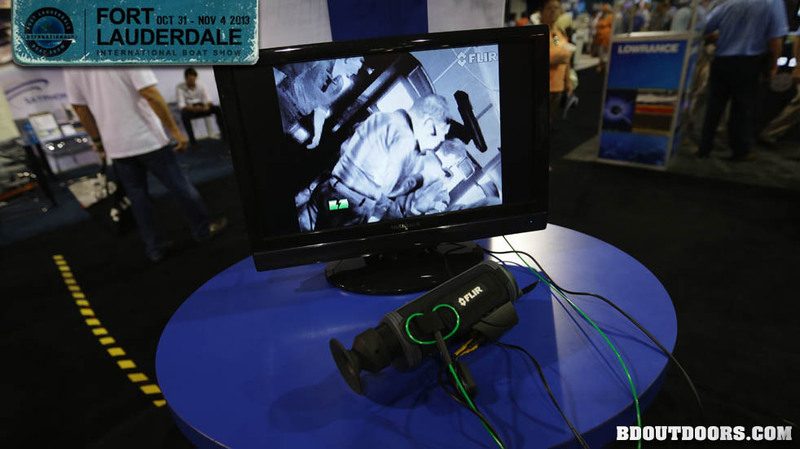 Running in the dark or MOB situations are some of the ideal uses for a FLIR. 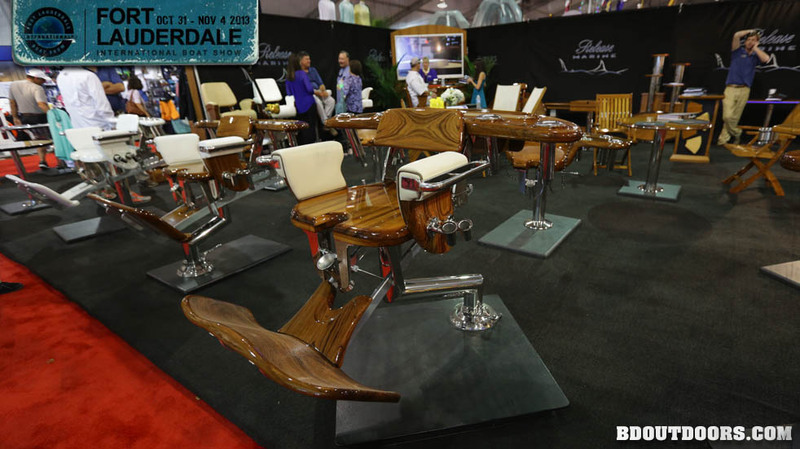 Release is one of biggest names in fighting chairs,helm chairs and high-end boat furniture. 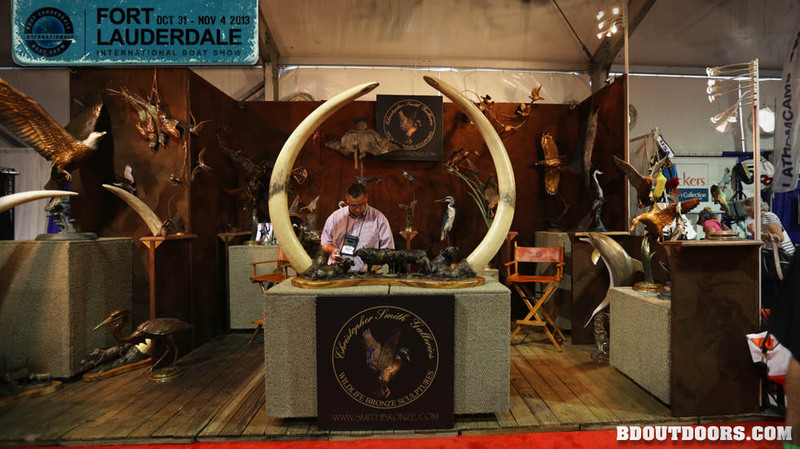 They had many of their innovative models on display. 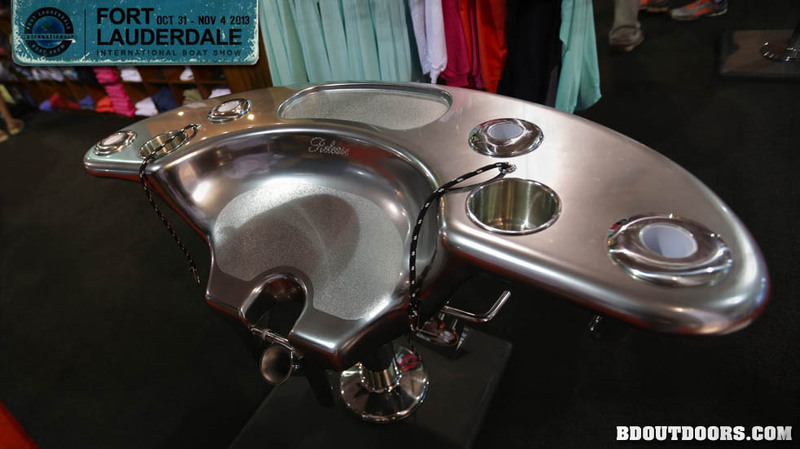 Releases Battle Saddle in a unique silver finish. 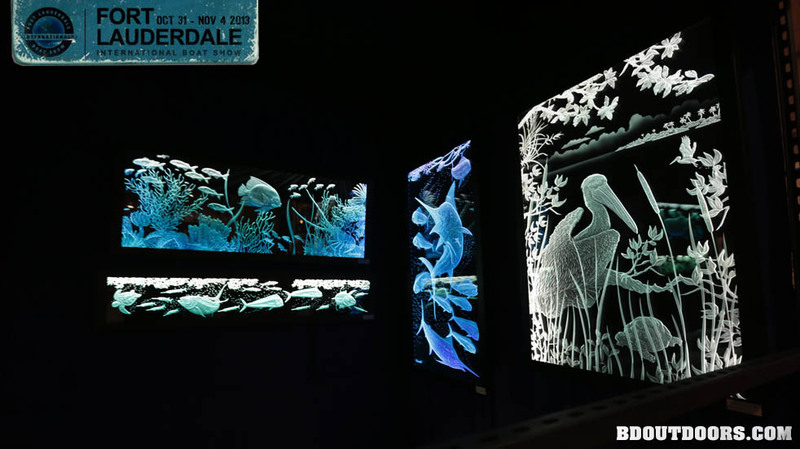 These elegant backlit, etched glass window artworks are popular highlights for your multi-million dollar sportfish. 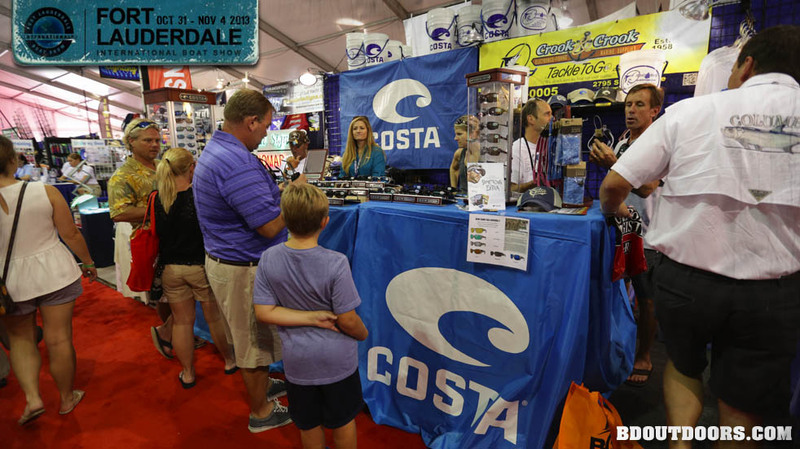 The ever popular Costa sunglasses were on display for anglers to try on and purchase the most recent designs and the classic ones too. 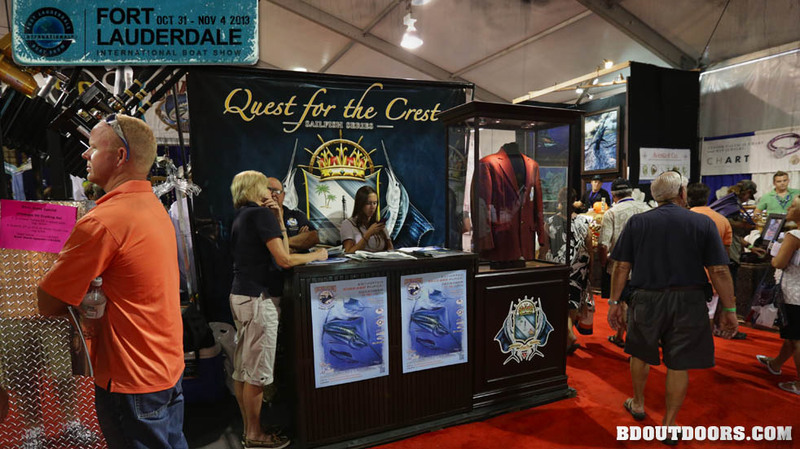 Quest for the Crest Sailfish Series had a booth to represent this popular sailfish tournament series where elite teams will compete for bragging rights and the “crest” adorned jacket. 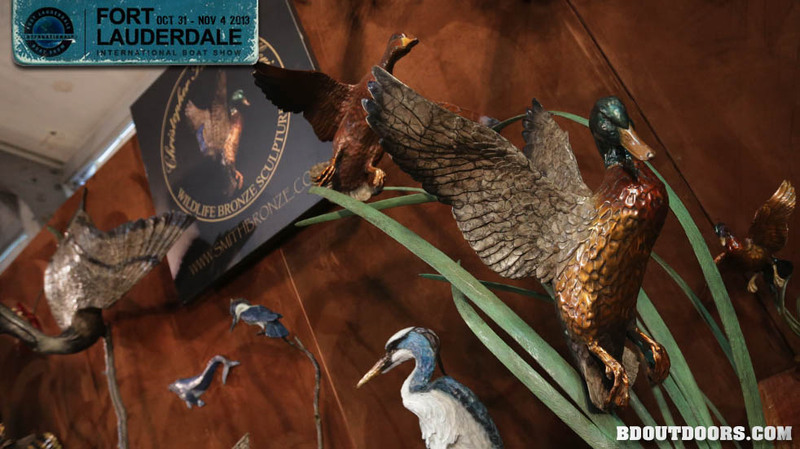 The amazing bronze artwork of Chris Smith was an eye catcher. Amazing life-like bronze sculptures by Chris Smith. Ever popular underwater lights for boats are evolving with led technology. Ocean Led is an industry leader. High power LED light, low power consumption go hand in hand on a boat. 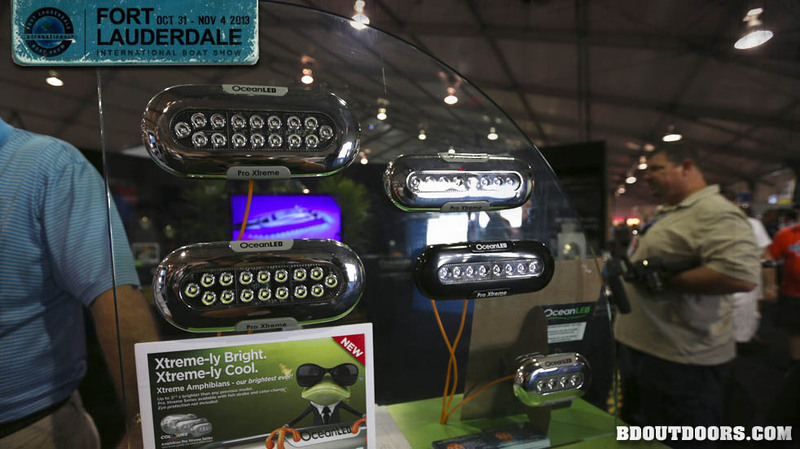 Ocean LED has developed many different models for varying uses. Five-year-old Milt Shedd cast a small shadow as he walked on the Santa Monica Pier next to his father in 1927.